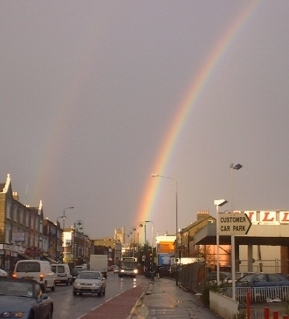 On Friday 22 November 2002 I walked out of my front door, to see a rainbow so strong that people were coming out of pubs to point it out to each other, and shoppers were stopping to look. I could not resist taking some photographs of this phenomenon. View down the High Road, towards St John's Church. A beautiful double arch appearing to end in the Churchyard. All colours can be seen in the close-up. 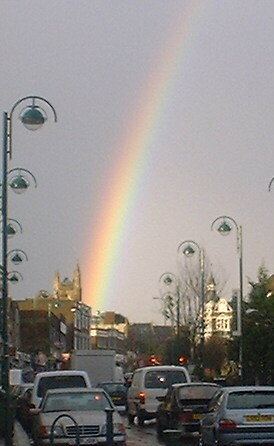 The rainbow appears to strike the church grounds. If you would like to use any of the images please complete this form to request permission and credit Flash Wilson, webmaster of Leyton.Info website.